Chile Earthquake News & Updates: Tsunami warning has been lifted as of now. Earlier Chile experienced a major 7.6 magnitude quake on Sunday. It forced thousands of people to evacuate the coastal areas from a region which is famous for tourism and salmon farming. So far, no fatalities have been recorded caused by the Christmas Day earthquake. After confirmation, the officials removed told everyone that there is no need to worry about Tsunami. The warning was issued to areas within 1000 km (621 miles) of the epicenter of the quake. 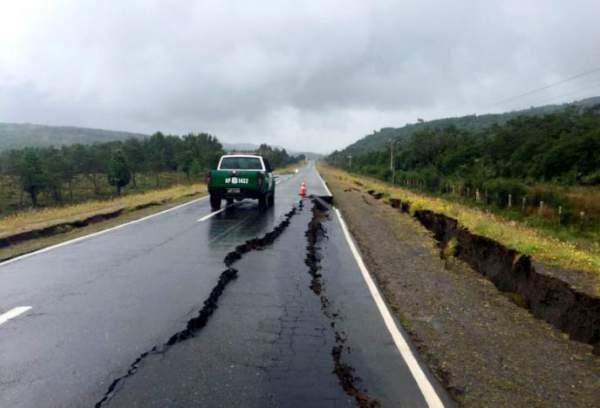 The epicenter of the earthquake was found out to be at 225 km (140 miles) southwest of Puerto Montt. The navy of Chile confirmed that eight small ports in the affected area were closed for the time being. The other side of the Andes mountains in Argentina also felt the quake. However, the structural damage was limited in the areas close to the epicenter as told by the witnesses. A witness said TRT that some roads and one bridge got destroyed in Quellon (Chiloe Island) which is a famous tourist destination in Chile’s Los Lagos region. Chile’s National Emergency Services (Onemi) chief Ricardo Toro confirmed that a tsunami watch is still there even after lifting up of the warning. He again suggested people of Los Lagos leave the beaches and move to higher ground. He also said that more than 4000 people were evacuated from that area. According to the US Geological Survey, the quake originated 34.6 km (21.5 miles) inside the earth. The effects were felt in the southwest Argentine city of Bariloche. Fishing and agriculture company Empresas AquaChile SA also evacuated its employees from the watch zone, and there was no damage reported from its facilities. There are a number of enterprises which have industrial salmon farming operations in that area. The industries include Blumar SA, Cia Pesquera Camanchaca SA, Australis Seafoods SA, Multiexport Foods SA, Invermar SA, and the local unit of Norway’s Marine Harvest ASA. The earthquake didn’t affect the copper production of Chile as there were no major mines located near the affected zone. Southern Chile’s state-run oil company ENAP [ENAP.UL] is said to have been operating its Bio Bio refinery normally. The Puerto Montt airport is also operating normally. There is an extensive list of deadly quakes occurred/hit Chile. It includes the 8.8 magnitude earthquake which hit the country in 2010 and triggered a tsunami. It caused a vast devastation of coastal towns.